Should You Buy A 3DTV? There have been plenty of advancements in home entertainment technology in recent years with things like full high definition televisions improving the quality of images. Most of these recent advancements have been taken in with open arms and found themselves easily selling to the mass markets except for one which has divided opinions for different reasons – 3D Technology. 3D technology has been put on televisions by big name manufacturers like Sony, Panasonic, LG and Samsung since March 2010 in the hope that since the introduction of 3D films at the cinema, they would sell like hot cakes for people looking to get the same 3D experience in their home for watching 3D films, Sky 3D or playing 3D games. This hasn’t been the case, research by Deloitte back in August 2010 found that only 2 percent of UK consumers were planning on purchasing a 3D TV for the next 12 months onwards from that. Deloitte’s research proved to be fairly accurate too as 3D televisions still haven’t managed to fly off the shelves as quick as some manufacturers may have hoped for. So what are the negatives that have led to such poor sales with 3D televisions? 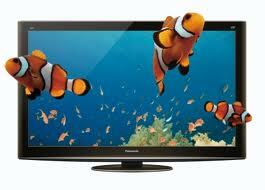 The main negative with 3D televisions like most non necessity goods in a tough financial climate is the price. With 26 million households having TV in the UK, a new television is not at the top of most people’s lists of things that they need to go out and buy especially when a price tag of about £2000 is what you would have to pay for a 55” 3D ready Samsung TV and that’s before buying the 3D glasses which for an average size family will start taking you towards the £2500 mark which isn’t exactly loose change. Another question you have to ask yourself is what would you do with your old 55” television that is working fine at the moment? It is a question you have to ask yourself before considering spending so much on a TV that probably isn’t as good as your current TV, the only difference being it is 3D ready. Is that worth another £2-3000? Which probably leads you to ask are there any alternatives out there? This comes in the shape of 3D projectors. A lot cheaper than a 3DTV set up as people can get a full 3D set up with a projector ready to connect to their sky box, blu-ray player or games consoles for under £1000. Only a small percentage of people know about 3D at the moment and an even smaller percentage of those realise you can achieve 3D with a 3D projector set up in your home. So an obvious advantage there is the price. Another advantage is the ease of use, within 5 minutes, a 3D projector can be set up on a coffee table ready to bring life size images on to a projector screen or a white wall. It doesn’t take a genius to realise that when you get an image in your living room double the size of a 3DTV for less than half the price, that a 3D projector is a more affordable, realistic 3D solution. Sporting events like the 2011 Rugby World Cup which starts today would appear so much more lifelike. Picture the difference between seeing a huge 6 foot life size England rugby player running towards you and scoring a try in your living room or only being able to see a small 3D man that you would see on a 3DTV. One disadvantage with 3D projectors before was that the highest resolution you could get was 720p but with Optoma recently releasing a 1080p 3D Projector this means that images can now be displayed in full high definition for the highest quality. That means that you can get the most out of 3D games, Sky 3D and 3D blu-rays from modern 3D projectors. Is there a future for 3D? With the emergence of companies like Legend Films from San Diego who turn older 2D films into 3D in a matter of weeks and the BBC starting to record popular Saturday night programmes like Strictly Come Dancing in 3D for the public to watch, it seems that 3D will be here to stay. With greater awareness 3D projectors can ensure to boost the growth of the 3D market as they are more accessible to the public as the solutions are cheaper than 3DTV’s and much larger images can be achieved, great for filling a wall with life size 3D football players, next year’s London 2012 Olympic events or your favourite games and films. The future of 3D could be big. With the help of 3D projectors.